Next up for new music is completely on the flip-side (compared to the last post). I have been listening to a bunch of stuff released by Peanut Butter Wolf's Stones Throw label (Matt and I actually had a talk about it at The Standard on Sunday) and just discovered their off-shoot label called Now-Again Records that specializes in funk releases. 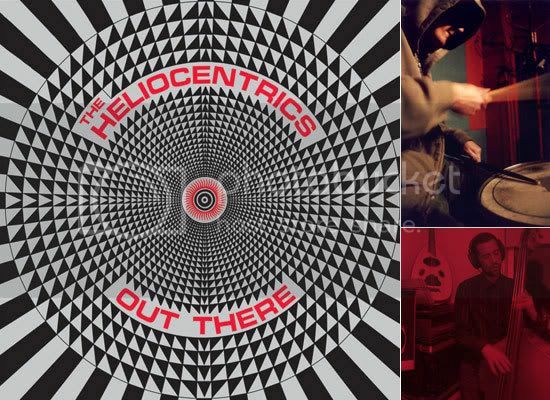 "From the drummer sampled by Madlib and Yesterdays New Quintet... From the band that backed DJ Shadow..."
Malcolm Catto leads The Heliocentrics through psychedelic, jazz, funk, hip hop, electronic and to be honest once you start listening, you don't care. In fact, I want to finish up this post, just to keep listening to it without interruption. These are one of those records you play from start to finish. The songs meld from one to the next but never get boring. The bass line keeps it moving, the drums snap your mind in and out of consciousness. On top of that I really enjoy the space travel theme of the album. Sprinkled with choice spoken samples it helps keep the album cohesive.